Family Holiday Hamlet - Heated Pools, Golf, Tennis, Creche, 10 mins to beach! Thoughtfully Renovated Cottages at the Family Resort, Le Manoir de Longeveau.. Le Chai has been renovated from an old stone farm building at the back of the Manoir garden. The property benefits from the morning sun at the front and the afternoon / evening sun at the back. It features many of the original beams and stonework, with great views of the golf course and open countryside. This spacious cottage comprises an open plan kitchen / dining / living area at ground level, with a w.c. and shower room. An oak staircase leads up to a mezzanine double (or twin) which overlooks the living space. There is a small terrace at the front and one at the rear, with steps leading down to a shared garden which in turn backs onto the golf course. The property comes equipped with all of your tableware and kitchen requirements and laundry facilities are provided close by. Extra equipment is often available on request, particularly for babies and children.The garden is furnished with sun loungers, outside dining and a BBQ, perfect for enjoying the long summer evenings! toilet, shower, Shower room and w/c. A seperate shower room and w/c. Le Chai is a barn conversion featuring many of the original oak beams and stonework. My wife and I spent my birthday at le Manoir de Longeveau. We had a wonderful relax in the beautiful Charente countryside. The apartment we stayed in was very comfortable and spotlessly clean. The kitchen was well kitted out - perfect for knocking up the occasional cassoulet. The outside space at the Manoir is verdant and very pleasant to be in. The facilities were perfect for our needs. We enjoyed playing a few games of tennis and ping pong and taking the occasional dip in the well maintained heated outdoor pool. There is also a 9 hole golf course. The on-site bar is well stocked with a great selection of local wines and the staff are very friendly and attentive. It is also possible to order bread and viennoiserie which is delivered fresh by the local baker each morning - a nice touch! 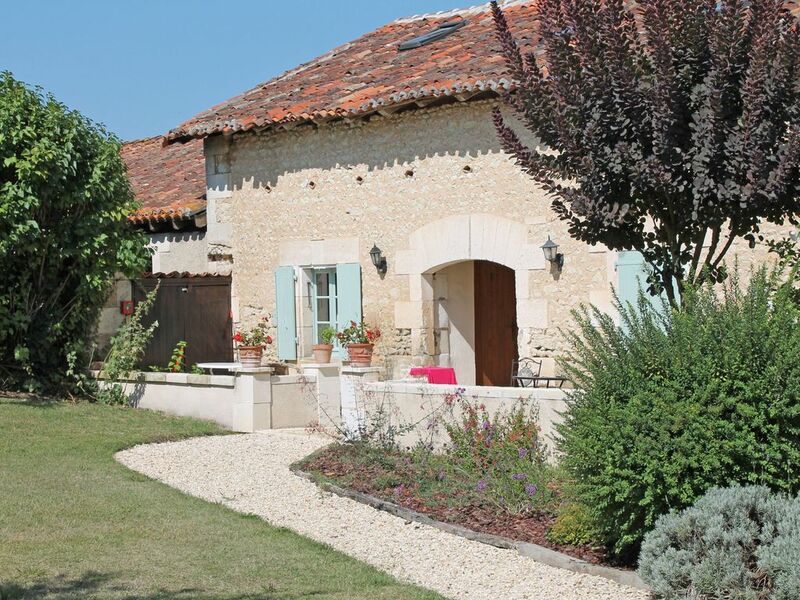 The apartments are in a very peaceful location built from what was once a cognac estate. Although secluded, it is only about 5 minutes by car to the nearest small village of St Severin where there are a few shops, and about 10 minutes by car to the beautiful (and slightly larger village) of Aubeterre, which is a very picturesque spot to enjoy a cool drink and a bite to eat. Le Chai is located in a row of renovated old farm buildings at a former Cognac Estate, Le Manoir de Longeveau. Longeveau is nestled on the Charente / Dordogne border, in a valley designated by the Michelin guide as ‘a place of special beauty’. The hamlet offers a selection of thoughtfully renovated stone cottages, with a superb range of facilities including golf, tennis, restaurant & bar, plus children's play areas, a summer creche and plenty more. A bike ride to one of the prettiest villages in France, with river beaches, cafes, restaurants and plenty of history. Longeveau offers you the chance to relax, refresh and enjoy life..!